Good night everyone - head over to the BBC Football page for all of the reports, reaction and more from a busy night of football. Arsenal manager Arsene Wenger believes they can make the Champions League group stage by getting the win they need against Olympiakos in Greece. He said: "We had to come out of tonight with a chance to get through. We have - now let's make right what we did not get right up to now." Maicon, Roma defender: "We tried to play our football but tonight we didn't manage to do anything. We were lucky to lose only 6-1 actually. Our objectives for the season do not change but we have to play differently from tonight. We never really tried to play, we did zero, nothing." Northampton are just two points off the top after a 2-1 win at Crawley. Leaders Plymouth and second-placed Oxford both drew 1-1, against Leyton Orient and Newport. Portsmouth thrashed York 6-0, while Carlisle joined them in the play-off places after a roller-coaster 4-3 win at Luton as the home side squandered a 3-1 lead. Dagenham and Redbridge climb off the bottom after a 1-0 win at Wimbledon. Yeovil drop to the basement after losing 1-0 to Wycombe. Mesut Ozil has now been involved in 11 goals in his last nine appearances (all competitions). Ozil scored only his second ever headed goal tonight in any competition (also v Norwich in October 2013). Arsenal manager Arsene Wenger on BT Sport: "It promises to be a very interesting game [against Olympiakos], but at least we have a chance. I think Mesut Ozil had an outstanding first half, he has got the taste for scoring now. I have never seen Ozil in the box so many times as in the last five or six games. "The Europa League is not the target - let us give everything to remain in the Champions League." Chelsea defender Gary Cahill, speaking to BT Sport: "It takes it into the last game but we also need to build confidence and momentum and it gets us going in the right direction." Chelsea manager Jose Mourinho: "It was very important especially with what happened in Porto. It is also important to have two victories in a few days. I hope tranquility comes, morale comes, confidence comes. "In this moment we are in a good position. They [Maccabi] don't deserve such a hard punishment, they did OK for periods of the game with 10 men. "Asmir Begovic had a beautiful hand to keep a clean sheet. The pitch doesn't help, it was really difficult for us. One injury yesterday with Ramires, one for John Terry today and I'm happy with just two. The pitch is really bad. John is a doubt for the weekend but I don't want to speak without tests." Leaders Coventry saw their advantage cut to one point after they were held to a goalless draw at Bradford. Second-placed Gillingham took full advantage with a 2-0 win over Rochdale. In the play-off places, Burton leap-frogged Wigan into third after a 1-0 win at the DW. Walsall drop to fourth after losing at strugglers Swindon. Bottom side Crewe came from 2-0 down to beat Colchester 3-2, with Ryan Lowe netting a 93rd-minute winner. Chelsea, Dynamo Kiev and Porto can all end up on 11 points in Group G - a statistical confusion if ever there was one. But, because of head-to-head records Chelsea need just a point against Porto in the final game. Arsenal have more than enough talent to get the 2-0 win - or any win if they score three or more - against Olympiakos in Greece to secure a place in the knockout phase in their final group game. But it will be a hostile, fierce test of temperament and the Gunners have been found wanting before. Make no mistake, if they do not get out of this Champions League group it must be treated as a dismal failure. A 2-0 win for Arsenal in their final game against Olympiakos or any win with a two-goal cushion (eg 3-1) would put the Gunners through. Arsenal defender Hector Bellerin: "The team knew it was a very important day today - everyone had to turn up and they did. Now we're going to play for our lives [against Olympiakos]. The team is showing we have got a lot of quality, a lot of creativity. When we have all our players back, we're going to be up there." Chelsea have found a way to get back to winning ways, and it helps scoring from set-pieces. Willian's free-kick and headers from corners from Gary Cahill and Kurt Zouma got them rolling. Mahesh: All the optimism and accolades about Arsenal performance today are laughable - it was against the whipping boys of the group. Abdullah: Chelsea defenders seem to be the best strikers, two goals from defenders today, Cahill and Zouma. Have Chelsea turned the corner? Jay: Wasn't this supposed to be a horrible season for English clubs in the Champions League? Still playing in Haifa, where Loic Remy and Maccabi keeper Predrag Rajkovic come together in a horrid collision. Ouch indeed. A lengthy stoppage but thankfully it looks like they are both going to be OK.
At least he kept on plugging away. Former Manchester City striker Edin Dzeko, who missed a headed sitter and a penalty, heads in for Roma in stoppage time. "It was at the top of the pitch where the game was done. Mesut Ozil and Alexis Sanchez were a joy to watch, but Joel Campbell was superb too - especially in the second half." Another goal from a set-piece, that's three tonight. Kurt Zouma rises unmarked to meet a corner and head home. Tom Reid: Possibly the best Champions League night for goals. Nico Kyriazis: On balance, probably the most exaggeratedly predictable night of Champions League football ever. "Alexis Sanchez and Mesut Ozil have been linking well for a couple of weeks now, and some of the moves they put together are just phenomenal. Two headed goals from Ozil would have been a first!" Consolation goal time for Roma surely? Defender Thomas Vermaelen fouls Edin Dzeko. The former Manchester City man elects to take it, but fires his effort at Marc-Andre ter Stegen. Not a great night for the Italy side. So nearly a brilliant goal! Alexis Sanchez is the ball-carrier, he flops the ball over the defence and perfectly onto the run of Mesut Ozil, the keeper is out and Ozil back-heads it over him - but a yard wide. Brilliant link-up play between the two of them. "Arsenal have played very well. Zagreb came to sit in and try to play on the counter-attack, but it was only a matter of time before Arsenal picked them off and started working in the areas that they want to work in." We think - not confirmed - that Chelsea will qualify for the last 16 with a draw against Porto in their final group game. Tom Chance: Great cross from Baba Rahman. Has had some stick for his defending at times, but that was top class. Jonny Duchezeau: What a cross by Baba Rahman, Chelsea have been missing a full back who can put a ball into dangerous areas. That's 10 goals in four days against Real Madrid and Roma for Barcelona. What's a par score at the Nou Camp? "Calum Chambers in midfield makes sense. He's not going to have the impact that Francis Coquelin has got, but he's got a defensive mindset and fresh young legs. I think Arsene Wenger can develop him into a top defensive midfield player." Neymar still cannot get on the scoresheet. He wins a penalty after he is fouled by Salih Ucan. However, his resulting poor penalty is easily saved by Wojciech Szczesny. Unfortunately for the Poland keeper, Adriano, following up, smashed in the rebound. Javel Bleach: Willian: he's a bit of a phenomenon, isn't he? Keepers KNOW what he's going to do & still can't react. Ola Ozone: Stand down Messi...Willian is the new free-kick king. Wasiyullah Budye: Willian and free kicks are a better love story than Twilight. Santi Cazorla and Hector Bellerin come off, Mathieu Debuchy and Calum Chambers come on. So we will see Chambers in that midfield role. Chelsea are finally making that extra man count and are cantering to a win now. This one is all down to Baba Rahman on the left. He puts over a teasing cross and Oscar, arriving like Paul Scholes, nods in from close range. Great cross, good night's work. "I think that's a penalty. Eduardo has stopped Alexis Sanchez coming inside and hitting that one." The superb Alexis Sanchez weaves into the penalty area down the left, Eduardo steps out and there's contact - penalty? Referee Viktor Kassai says no. Francis Edwards: Only one team in the world who can go down to 10 men and look like they're playing with 14, that is FC Bayern Munich. France winger Kingsley Coman, who played against England recently, nods in Thomas Muller's headed ball in the area. This is easy street for the German champions - but did we expect anything else? Willian. Free-kick. Over the wall. Bottom corner. Standard. On Arsenal's chances of winning a last-16 tie: "Over two legs I'm not sure they have what it takes defensively." John Terry has picked up an injury - I didn't see what happened - but he is leaving the field on a stretcher. Kurt Zouma is on. Simon Murphy: Fabregas has been woeful once again. Give Loftus-Cheek a chance! Andrew Neill: Hard work done for Arsenal. Get Ozil or Sanchez off with Jeff Reine-Adelaide coming on! Eden Hazard, it's just not happening for him. He comes off and Pedro is on for the last 20 minutes. Remember, as it stands Chelsea are not through tonight. "That goal was all about Joel Campbell. He's had a brilliant game. He threads a fantastic ball between the two defenders - I don't know how he saw it. Alexis Sanchez does brilliantly to take it round the keeper." Well played Joel Campbell! He cuts in from the right, plays a reverse pass which takes four defenders out of the game and finds Alexis Sanchez jagging across goal. Sanchez skips around the keeper and buries his shot from a tight angle. "I think Olivier Giroud has looked a little tired and subdued today. None of the injured Arsenal players has been missed more than Aaron Ramsey - the job that he does is hard to replicate." Aaron Ramsey is back after a long spell out injured. He's just become a new dad too. Just over 20 minutes left for him to have a run out. Get back up to speed. Lifa Nati: A lot of those Chelsea players don't look interested against 10 men. Why is the manager not making any changes? A flurry of chances at either end! Eden Hazard has a stinging half-volley well saved, Cesar Azpilicueta then also sees his strike pushed clear before the hosts counter and Eran Zahavi has a shot saved by Asmir Begovic. A second Chelsea goal is definitely needed to settle the nerves. This game is already being played as if it is moving towards an inevitable conclusion as Arsenal remain in complete command. Of course one goal from Dinamo Zagreb would change the mood completely but it is hard to see where that is coming from at the moment. Poor Wojciech Szczesny. The Roma keeper, on loan from Arsenal, fails to push away Lionel Messi's first-time shot, allowing the Argentine to tap in his second. Guess which players combined in the build-up? Neymar on the left, laid the ball of to Luis Suarez, whose mishit shot arrived at the feet of Messi, who did the rest. All this talk of "pass master" Cazorla is laughable. Are people forgetting his performances against Spurs and West Brom? Slight reality check Arsenal fans. This is a League One quality opposition, hardly a guide to beating Barcelona in round 2! Joel Campbell is the man on the end of a neat passing move, a defender just gets a slight touch to the ball and it puts the Costa Rican off a touch, and he shins the effort wide in the end. Viv:@ChelseaFC really needs to step it up a notch. Goals needed to kill off this game before they concede an equaliser. Arsenal are not exactly going through the motions but they are taking it easy now. They know they've done the hard work. "With the quality that Arsenal have, you wouldn't bet against them getting the result they need at Olympiakos." Defender Gerard Pique scores. What was he doing up front? Yet again Neymar, Luis Suarez and Lionel Messi combine. Pique is left just to tap in Argentine Messi's square ball. Pique celebrates and is then makes way for Marc Bartra. Pique spent the last 10 minutes of El Clasico up front sniffing a goal. A maverick. Bayern defender Holger Badstuber is shown red for bringing down former West Brom forward Brown Ideye. Hope for the Greek club? Excellent play from Baba Rahman as he eats up ground down the left before picking out Eden Hazard in the middle. Is it a tap-in for the Belgian? No, he just doesn't get there and it's cleared. A lack of conviction there. Brilliant from Alexis Sanchez. Brilliant skill to perform a seal dribble past four men, bobbing the ball along almost on his nose. Eden Hazard has got lots of strings to his bow but tracking back is not one of them. He just points at his man, Eli Dasa, as if hoping that someone else will pick him up. They don't, Dasa is in on goal but Asmir Begovic makes a top-class stop. Eddie: Flamini with 35 passes so far; 2nd only to pass-master #Cazorla. Blimey..certainly grabbing his chance to impress. And now Chelsea are back in play in Haifa. As it stands it won't be quite enough to see them qualify tonight. They need to better Dynamo Kiev's result in Porto. Arsenal out flying, Santi Cazorla hammers a shot on goal before Olivier Giroud flicks a header which causes Eduardo to make a decent save. As a short aside, if you can find me a team who have had a better few days than Northampton Town I'd like to hear it. And if you like a great post-match interview (a rare beast) track down Chris Wilder's interview at Notts County on Saturday. In League Two, Northampton - who have this week taken a huge step towards financial survival - are currently on their way up to second in the standings as they lead 2-0 at Crawley at half-time. In other games, Leyton Orient are also winning away from home. They are 1-0 up at Plymouth. In fact, it is a good night for many away sides in the division so far. Cambridge United are winning 3-1 at Morecambe,Exeter lead Mansfield 2-0 and Newport are 1-0 up at Oxford United. "For me, if Rooney's fit, he should play for Manchester United against PSV Eindhoven. He's the captain and he's the best option up front." In domestic action, Gillingham are looking to close the gap on leaders Coventry in League One and they are 1-0 up against Rochdale, Bradley Dack with the goal. Coventry are currently being held goalless by Bradford. Elsewhere, struggling Swindon are 1-0 up against high-flying Walsall at the break in League One, Jon Obika with the goal, while Shrewsbury and Southend are looking good for away wins. They lead Oldham and Sheffield United 2-0 and 3-1 respectively. Barnsley, in the relegation zone, are drawing 1-1 at Peterborough, while Colchester are 1-0 up at home to bottom-of-the-table Crewe. Barcelona played 421 passes in that first half, or 9.35 a minute. Or one every six seconds. Ish. Luke: How did the Premiership clubs overlook Douglas Costa for £20m? He even makes Hazard look useless. Luis Suarezscores his second with a ridiculously good finish. The former Liverpool forward volleys in from 15 yards out with the outside of his boot. A stunning strike. Roma want to hear the full-time whistle, not the half-time whistle. Bayern Munichare set to claim top spot in Group F thanks to goals from Douglas Costa, Robert Lewandowski and Thomas Muller that have put them 3-0 up at second place Olympiakos. Barcelonaare 3-0 up against Roma. Goals from Luis Suarez and another sublime effort from Lionel Messi, making his first start since injury. Well, well , well worth a watch if you can. Chelsea a goal up and a man up. An excellent 45 minutes for Arsenal. Jeroen Verheggen: All I want for Christmas is a world class striker and holding midfielder and we could win @ChampionsLeague with @Arsenal. Goonerama: Excellent. Now, you know best Arsene, but... *please* give Sanchez 45 mins' rest and bring on Chambers alongside Flamini. Arsenal winning 21-3 when it comes to touches inside the opposition penalty area. Arsenal are purring along now - Mesut Ozil's low shot is turned away but it was another driving run from Nacho Monreal which set up the chance. The left back is thoroughly enjoying himself. "That doesn't surprise me. I've trained with Tal Ben Haim - he loves a tackle." Nat297: Sanchez is a magician! Vishnu Ladwa: Absolute shambolic defending by Dinamo! But the end result is quality! Come on you Gunners. Tal Ben Haim (I) the former Chelsea defender, sees red for a crazy lunge on Diego Costa. We all know Costa is a wind-up merchant and he has obviously got to his man, as Ben Haim just volleys Costa into the sky. He has to go. Crazy! Mesut Ozil playing like the £42m playmaker that he is tonight, gliding away from trouble and having a shot turned away. Almost a third! Chelsea's best route to goal remains a set-piece as Willian's free-kick is close. A goal for Dynamo Kiev in Porto means that Chelsea would not qualify tonight now as it stands. After a slow start those two quick goals have put Arsenal in complete command - and ready to take this Champions League group down to the wire. Mesut Ozil is pulling all the strings while the energy and power of Alexis Sanchez is too much for Dinamo Zagreb. "You can't afford to come to the Emirates and gift opportunities like that. I don't know why you would try and play that ball in that situation - just clear your lines. It's brilliant from Nacho Monreal to be on the front foot though." Luke: What a goal by Arsenal! Cazorla is such a joy to watch. He made that skinning four on the edge of his own box! David Johnson: Ozil scores with a diving header. Pretty sure there's a pig flying somewhere. He made the first, and he scores the second as Arsenal take a commanding grip on this game and on their Champions League hopes. It's a horrible error from a Dinamo defender though as he tries to play a pass INSIDE his own area, Nacho Monreal cuts it out, beats a man and squares it for the simplest of tap-ins for Alexis Sanchez. The Emirates is lifted, buzzing now. Arsenal are winning and Bayern Munich are in cruise control. All is well for the Gunners. In Haifa Diego Costa is close to a second for Chelsea but his overhead kick is always flying wide. Ahmed in Leicester (see 19:55) is trying to find a solution whilst revising for diagnostic radiography. I'm trying to find out possible pathologies Arsene Wenger might have to not be able to hear the screams of Arsenal fans to sign a world-class striker whilst revising for my diagnostic audiology exam! Together we will find a solution! Twenty-seven passes, six touches for Lionel Messi, four for Neymar and two (including the final assist) for Luis Suarez. "It's brilliant from Alexis Sanchez. It's just a little clip into the six-yard box, and Ozil times his run to perfection, and he's brave too - he could have taken one to the face. The keeper really should be looking to come out there." Vintage Arsenal. A really brilliant goal which starts on the edge of their own box, Olivier Giroud gets a foot in to flick the ball to Mesut Ozil and the counter attack is on. Speed merchant Alexis Sanchez takes the ball on at lightning pace, he carries it what, 50 yards downfield? And then a cross to find Ozil haring in and the German applies a flying header. SVieira: What are the odds on a Barca - Bayern final? They are far and away the best teams in the world right now. Bernard Ryan: Bayern 3-0 up after 20 minutes in the Allianz. If the chance to take advantage wasn't screaming at Arsenal already, it is now. As it stands, Chelsea are going through to the last 16. Will that goal stem the counter attacks from the hosts? Surely it's game over in Munich? Bayern are now 3-0 up against Olympiakos - Thomas Muller tapping in from close range - as the German champions continue to rip their Greek opponents apart. Barring a miracle in that one, a victory for Arsenal will keep their Champions League hopes alive. Skeeta: Revising also for my final financial adviser exam. Could use #bbcfootball to get myself some professional footballers as future clients? Jose Mourinho has just been out on to the pitch to tend to that surface too. He gave a clump of turf a good kicking. Neymar, Luis Suarez and Lionel Messi combine, with the Argentine providing a familiar dinked finish over the reach of Wojciech Szczesny, who is set for a very busy night. That was Messi's 78th Champions League goal. Chelsea take the lead - but there was a sensational save in the build up! It's another set-piece goal for the Blues as Willian's corner is met by Gary Cahill, his header is somehow turned on to the post by Predrag Rajkovic, a superb stop, but Cahill reacts to meet the loose ball and hammer home. "It's important that you don't just camp in when you come to the Emirates. A team like Arsenal will wear you down. Dinamo are doing exactly the right thing - they're picking the right moments to attack." Chris Wellman: Poor the amount of empty seats at The Emirates. It's the Champions League, not a league cup game against lower-league opposition! Lovina Ironkwa: Bayern winning does not change anything. What guarantee do we have that Arsenal will win tonight? All going exactly as Arsenal want it in the other group game as Bayern Munich threaten to run away with it against Olympiakos. Now Arsenal need to win this one but it has all been rather quiet here so far. Plenty of possession for Arsenal but no real chances in a subdued atmosphere. More good news for Arsenal as Bayern stretch their lead - Robert Lewandowski hitting hard and true. It was only a matter of time Barcelona would fine the net. Luis Suarez scores for the European champions against Roma. Barcelona, who have qualified from Group E, have been knocking on the door since the first whistle. Lionel Messi, making his first start in two months, had the ball in the net and fired wide earlier. "He must be a dream to play with, Alexis Sanchez. Apart from everything he offers going forward, when Arsenal lose the ball, he sprints back to make sure that they regain possession." Chelsea now having all sorts of possession but - as on many an occasion this season - they look very fragile in front of goal. When there is a shot on, they lay it off. When they could take on a man they don't. That Bayern Munich goal - just to clarify - is excellent news for Arsenal and her followers. An Arsenal win, and a Bayern win, means that Arsenal live to see another week in the Champions League. 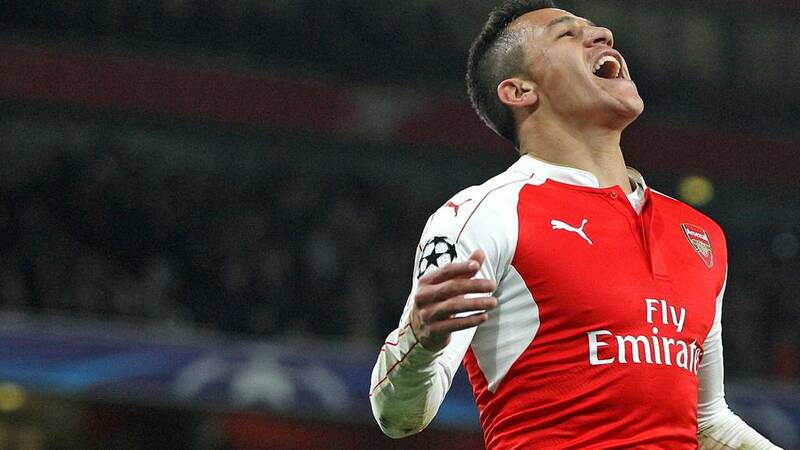 "It was brilliant play from Joel Campbell - he does the right thing to fire it out wide to Alexis Sanchez. What Sanchez does wrong is to cut inside - he should have gone on the outside and got a shot away." Eddie: Won't tire of saying #Ozil is a joy to watch with a ball at his feet. Poetry in motion. Worth admittance fee alone. Bayern Munich are doing their bit for Arsenal. The imperious German champions are 1-0 up against Olympiakos thanks to Douglas Costa's eighth minute effort. A draw in this match would end the Gunners' hopes of making the knockout stage. Elsewhere, Group H bottom side Lyon are leading Gent as a result of Jordan Ferri's strike. Anyone following the live text while doing anything more high-brow than that? Top work Ahmed. Arsenal are playing some really nice stuff now, first Mesut Ozil is almost lofted in over the top and then Hector Bellerin has a shot blocked. Revising for diagnostic radiography exams while checking the BBC Sport page for Arsenal updates. Searching my way through knee and ankle joints hoping to come to a solution for Wenger on minimising injuries! "You can already see some of the problems that Arsenal are going to be coming up against. At one stage, Dinamo Zagreb had all their players back around the six-yard box. It's going to be very important for Arsenal to use the width tonight - Hector Bellerin is a key player." Good chance for Chelsea now in an end-to-end game, Cesar Azpilicueta shoots over after a one-two with Oscar. Kiriama 16: I love seeing Wenger in a suit, the moment he wears his jacket I always smell danger. Arsenal are having a right flurry of injuries again but they put together a neat flowing move down the right, it is cut back and Santi Cazorla leans back and fires well over the crossbar. An early Gunners goal would settle the nerves down. "It's well documented that Arsene Wenger likes his heavy, sand-based pitches. They're beautiful to play on, but when I trained there with England, you used to feel the impact on your joints." Chelsea look a mess at the back as again they are cut open all too easily. Eran Zahavi is away down the left, his cross is hurriedly sliced out by John Terry and Eli Dasa fires over. Fine start from the hosts. Chelsea should already be behind, what a chance this is. A free header for Dor Peretz, four yards out, but he closes his eyes and heads it over. 50p head! Zagreb force a second early corner, Arsenal looking shaky in the very early stages. Remember Arsenal must win tonight - and then hope Bayern beat Olympiakos. And game on in Haifa too. A very sharp opening from the visitors sees them skip through the home ranks and win a corner. Tal Ben Haim (I) is the recipient of plenty of hand slaps from those Chelsea players who have played with him in the past. A sea of yellow and blue inside the Sammy Ofer Stadium. RE: Mourinho's pitch problems - one goalmouth looks particularly scarred. Thousands of empty seats at Emirates Stadium less than 10 minutes before kick-off - but seen this one before here when the latecomers roll up right on kick-off. Sure Arsenal's fans have not given up on this Champions League campaign just yet. All set for the game at the Emirates - but it's far from full. A reminder - Arsenal must win. What was he going for here? Lose tonight and Arsenal may avoid a spiral of results earlier than April Max! Max Seitler: Wenger's Plan: don't qualify, don't get thumped by European Giant in last 16, and avoid yearly spiral of results in April. Joe Wedgwood: Fed up with fickle @Arsenal fans! This talk of 'deliberately wanting elimination' is just pathetic! Did we take the Premier League's dominance of the Champions League for granted? Eight finalists in eight years, 14 teams in the semi-finals over the same period. Not a single team in the last eight last year. Was 2005-12 the last golden era of English football in Europe?Image caption: Was 2005-12 the last golden era of English football in Europe? Have you ever dreamed of playing in the FA Cup? Course you have! No such pitch concerns at the Emirates of course. A carpet of green awaits the players. Not long now. Jose Mourinho has gone early with his shout against the surface. It's hard to say whether he has a point or not yet - it does look to be cutting up a touch during the warm up. We'll see how it takes a John Terry challenge. "I think Mourinho just wants his team to get on a run now: calm down, and get back to winning ways. Silverware can wait for later in the season." If Arsenal do lose tonight, it will be their 50th defeat in the Champions League; only three sides have already reached that milestone (Porto, Galatasaray and Olympiakos). Joseph Maxwell: Could Arsenal win Premier League or Champions League with a player transfer policy that smacks of non-league philosophy? Cheddar Football: Let's purposely get eliminated from club football's holy grail & take a punt at just happening to chance upon winning the title. Jose Mourinho says the pitch in Haifa "is really bad." He says he expects a tough game on "a heavy, slow pitch." Arsenal manager Arsene Wenger has been speaking before his side's game against Olympiakos. On his team selection: "I've put players who know their positions in those positions and I didn’t want to be too adventurous with Aaron Ramsey after 31 days out." On keeping an ear on Bayern v Olympiakos: "I won’t need any special information about what is happening in Munich but I will be told anyway." In the build-up to tonight's game, Arsene Wenger criticised Uefa's drug regulations, saying current rules "basically accept doping". Wenger said the rule was "surprising". Do you not remember Paris 2006 Max? Flobalob: Arsenal's CL future may look bleak but realistically they're not. Arsenal and Bayern can both beat Zagreb and Olympiakos. Max Baggins-Craig: To many, Arsenal haven't really ever taken this competition seriously, they need an attitude/approach change if anything, simple. Bayern Munich and Olympiakos meet tonight knowing a draw would take both through to the Champions League last 16 and eliminate Arsenal. Germans Bayern are top of Group F on nine points, level with Olympiakos, after four of the six games, with Arsenal third on three points. Elsehwere, Porto will undoubtedly fancy their chances of reaching the Champions League knockout stage tonight. The Portuguese side are top of Group G with 10 points, three ahead of Chelsea, and need to pick up just a point against Dynamo Kiev - who have managed to win just five of their previous 35 group games. Finally, Lyon, bottom of Group H with one point, need to beat Gent and hope leaders Zenit beat Valencia to keep their hopes of progressing alive. A reminder that there is still time to vote for the BBC African Footballer of the Year. Algeria's Yacine Brahimi, the 2014 winner, is on the shortlist along with Gabon's Pierre-Emerick Aubameyang, Ghanaian Andre Ayew, Senegal's Sadio Mane and Yaya Toure of Ivory Coast. You have until 18:00 GMT on 30 November to vote for your choice. Terms and conditions can be found here. Make sure you stick the wireless on this evening, as BBC Radio 5 live will be following all the action from around Europe. Arsenal v Dinamo Zagreb will be the main game, with commentary from Ian Dennis and Jermaine Jenas, and analysis from European football expert Andy Brassell. Meanwhile, Conor McNamara will be providing updates from Maccabi Tel Aviv v Chelsea. Can Arsenal be trusted to deliver? Arsenal should have the ammunition to beat Dinamo Zagreb and keep their part of tonight's Champions League bargain - but they also should have beaten Monaco at Emirates Stadium last season and Olympiakos here during this campaign. The Monaco defeat wrecked their chances last season and the Olympiakos loss, coupled with a defeat away to tonight's opponents earlier in the group, are results that have left them in real trouble in the Champions League. So can Arsenal be trusted to deliver? The recent evidence suggests you wouldn't back them with complete confidence. "It would be interesting to see Arsene Wenger give Calum Chambers a run in that defensive midfield position. We've seen how well it's worked for Eric Dier at Spurs and I think Chambers is very similar to Dier: good stature, good on the ball." Here he is - Tal Ben Haim I has been reunited with John Terry I. Arsenal respond to the injuries of Francis Coquelin and Mikel Arteta by recalling Mathieu Flamini, who recently announced that he has developed a chemical process that could reduce the dependence on fossil fuels. Honest. Jeff Reine-Adelaide, a 17-year-old French winger described as "something special" by Arsene Wenger, is on the bench and could make his first senior appearance. The League Two match between Accrington and Hartlepool has been postponed because of a waterlogged pitch. There is a full (well, not now) schedule in Leagues One and Two tonight. Follow the latest live scores here. There's only two Ben Haims! Maccabi Tel Aviv are managed by Slavisa Jokanovic, who took Watford into the Premier League just six months ago. They also have former Chelsea (and Bolton, Portsmouth, Manchester City, Sunderland, er, QPR. West Ham and Charlton) defender Tal Ben Haim. And what's better than one Tal Ben Haim? Two of course!Yep, striker Tal Ben Haim (below) brilliantly goes by the name of Tal Ben Haim II. They both start. The sequel and the prequel. The fight for second place in Group E remains tight after Bayer Leverkusen drew 1-1 with Bate Borisov. The German side are level on five points with second-placed Roma, while Bate have four points. Leaders Barcelona have qualified for the knockout stage as a result of Leverkusen's failure to win. Roma face Barca, who hand Lionel Messi his first start in two months after he fully recovered from a knee injury. Zenit St Petersburg, who have already qualified for the knockout stage, made it five wins out of five in Group H with a 2-0 win over second-placed Valencia. The Spanish side finished with 10 men after Ruben Vezo was sent off. Since Arsenal last lifted the Premier League trophy Stefan Savic, Carlton Cole and Kieran Richardson have all pocketed a winner's medal. Robert Huth has won two. John O'Shea and Darren Fletcher have won four. Remember this Arsenal fans?Image caption: Remember this Arsenal fans? Arsenal have reached the last 16 of the Champions League for 15 successive seasons - but are in serious danger of ending that run this year. However, they have also not won the Premier League in 11 years. Would going out early in Europe help life back home? Could this perversely be Arsene Wenger's best chance of winning the title in a decade? Let us know where Wenger should be concentrating his efforts. Text us on 81111 (UK Only - pop your names on there) or tweet us using #bbcfootball. "For too long the 'top four' ambition has brought Arsenal down. It's time they set their stall out to win the league. "If Arsenal fail to win the title this season because of failing to strengthen adequately in the summer window - it's unforgivable, not signing someone to play alongside Coquelin. If they'd signed Morgan Schneiderlin or Sami Khedira, it would have made a real statement of intent. It's poor management."